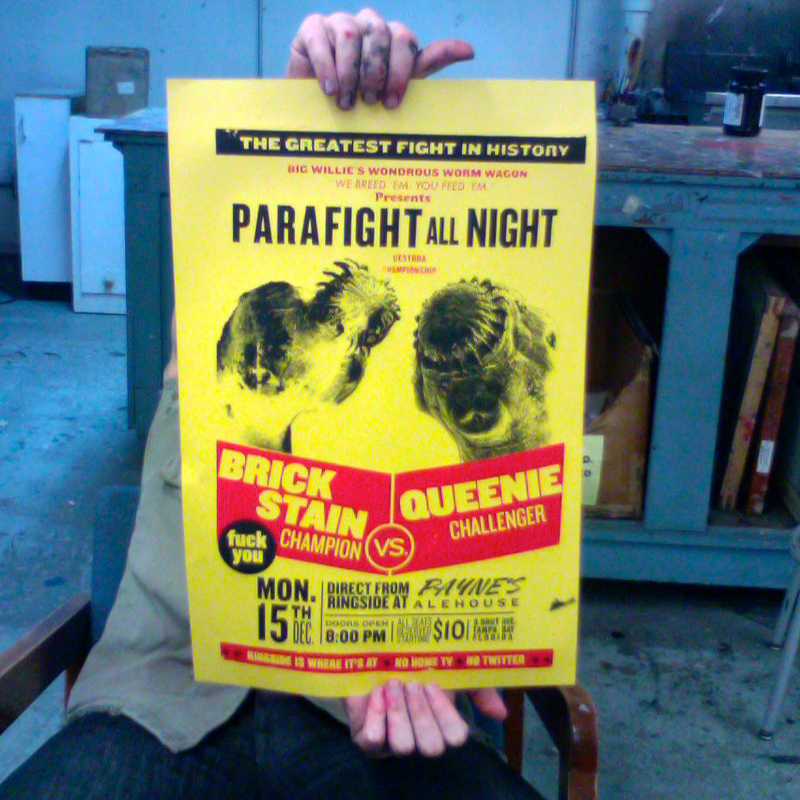 Last night I whipped up and printed these posters for my friend, Will Payne. He’s working on an underground tape worm fighting ring comic right now. I thought I’d celebrate his story by making a 2 color boxing match style promo for his story, PARAFIGHT. I made 12 of these and gave them all to Will. I used the Knockout type family for the majority of it and printed on a textweight yellow stock. Doing this, I learnt a little bit about typographic history. Particularly about the idea of how wooden type sets were designed as series before the idea of the rational typeface. It was really fun to step up to the challenge of knocking this out, quick and dirty. I’m typically very finicky and careful when it comes to screen printing, but for this poster I let myself go to town and did away with registration marks all together. It was nice to do this as quickly as I did, because it allowed me to learn first hand why these kinds of posters look the way they do in terms of the color interactions. With a poster like this, registration was, in the words of my printing teacher Jon Chad, like shooting fish in a barrel. The tapeworm photographs come from Gregory S. Paulson’s online archive of electron microscope photography. The design itself is my attempt at recreating what you see when you do a simple image search on Google for “boxing match poster”.